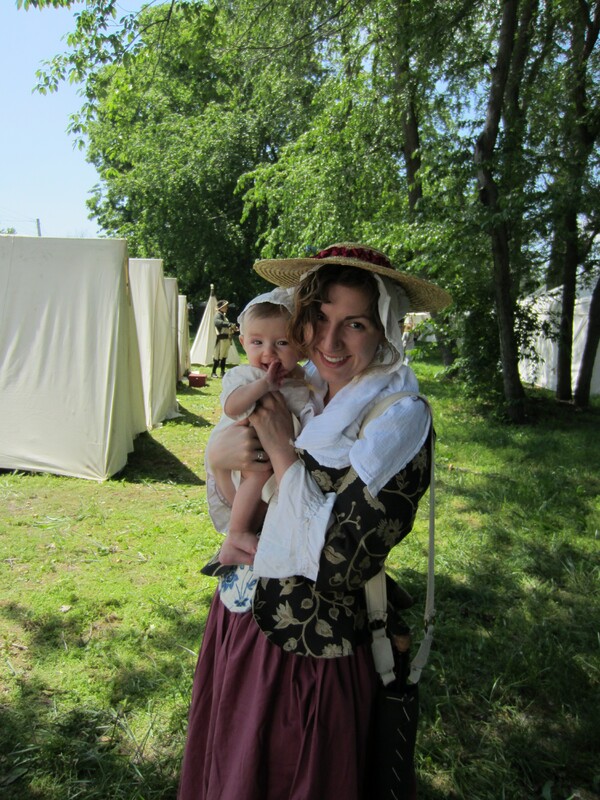 Well, we made it through the four days of the Spirit of Vincennes Rendezvous, and honestly, I think we did great! If you asked me during the event how I felt, my answer was typically, “tired.” But in retrospect, Ginny seemed to really enjoy herself, and a lot of things that could have gone wrong, didn’t. For instance, Ginny has never been outside for that length of time. That worried me, especially because she doesn’t particularly like direct sunlight. But the fresh air seemed to suit her. If anything, it just made her sleepy. I thought that was interesting…and I certainly wasn’t complaining when she took nice long naps. Then there were all the sounds. She didn’t seem to particularly like the fife and drum corps. I think the drums startled her. What’s funny is that she didn’t react at all to the cannon fire. I flinched…she just stared at me like I was crazy. I’d be worried except my God-daughter, who’s just a couple of months older than Ginny, didn’t seem to be affected by the big boom from the cannon fire either. Seems that even though these babies weren’t actually “on the gun” in utero, they still got some artillery in their blood despite our husbands’ best efforts. We didn’t have our swing with us either. I guess my canvas tent is big enough that I could have brought it, but hauling it there was a problem. The first night, Ginny refused to sleep while the party went on. She is my daughter after all, with a bad case of FOMO (Fear Of Missing Out). But the next two nights, to my great surprise, Ginny fell right asleep at bedtime. So this week I’ve felt encouraged to start skipping the swing and put her directly in the crib, and it’s working! So I’m learning…I mean, I’m a mom– when am I not learning? Getting onto the field at least once is important…otherwise you can’t help feeling like you could be doing all the same stuff at home in an easier environment. My sister almost literally pushed me into it when I kept thinking my usually fussy baby was too much to ask anyone to handle. I’m really glad she did. So in the future I really just need to make sure to let people help me…something I’m not very good at. On that note, thank you to everyone that gave me a hand last weekend with the baby. She may not have shown her gratitude…looking at you in horror when you sneezed, screaming when you took her into your arms, getting baby food all over you, quieted when you handed her off to someone else, etc. But you helped me, and a happy mom means a happier baby. 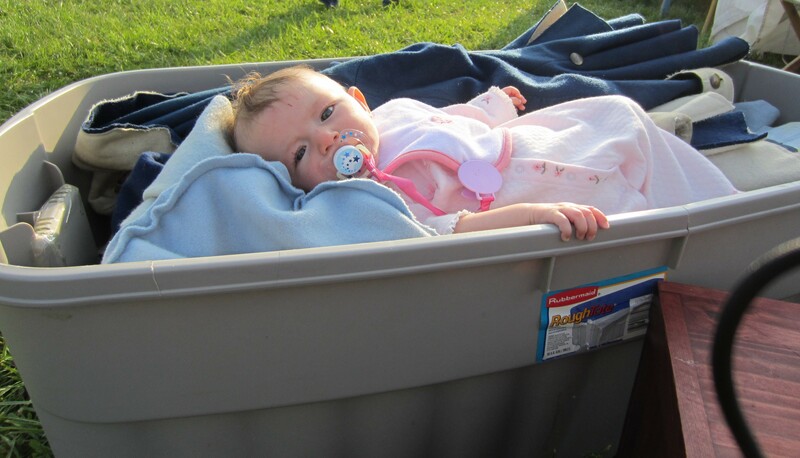 Packing Up Monday Morning… well you need to put her down somewhere! You’re 100% right on letting others help and letting others take CrabCakes for a while (or is that just my nickname for my kid?) We should be accountabilibuddies on this one! I think Ginny did great, and so did her mom! I agree. Accountabilibuddies it is! BTW, we call ours Fussy Fuss, to the tune of Super Freak: Fussy Fuss, Fussy Fuss. She’s super fussy. Yay Ginny and Yay Kathleen! It’s not easy having a baby in camp, but you did it! Thanks Mel, and you’re right. Easy is definitely not the word I’d go with.